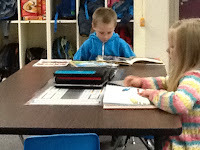 Practicing ABC's in reading group. 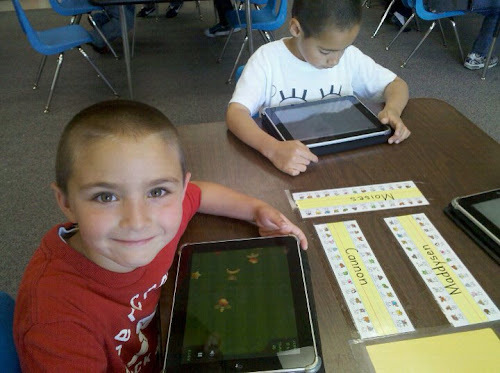 This is the first year of 1:1 iPads in my kindergarten classroom. In October 2010 I received one to use with my class of 26, and by the end of May 2011 I had 11 and my class had dropped down to 22 children. I absolutely loved that half the class could be working on the iPads completely independently, at various levels, while I worked with the other half of the kids. The ability level of the children in last years class was more varied than typical. The iPads were a life saver for me and allowed a greater level of differentiation than I could have done on my own- definitely to the benefit of the children. I begged and pleaded until I was assured I would most likely have a class set of iPads for the 2011-2012 school year. Sure enough, I started with 20 iPads for the 20 kids enrolled in my full day kindergarten class. They are the original iPads, hand me downs from the high school- they upgraded to iPad2's this year. Beggars can't be choosers though so I tried not to whine too much about the cameras I had hoped to have. So excited to use the iPads! 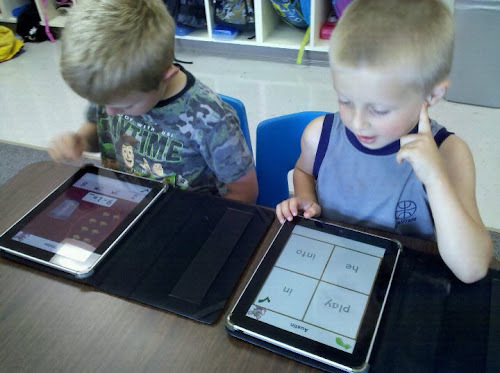 On the fourth day of school I introduced iPads to my class of 20 kindergartners. They had seen me syncing the devices in the back of the room and were quite excited to get their hands on them. I had planned on introducing the iPads in small groups, but changed my mind at the last minute for reasons I can't remember. I had the children sit in a circle and demonstrated some of the apps briefly and then gave them time to explore the iPads. Very little support was needed and they were instantly absorbed. One child already had an iPad at home so he was a good resource to the other students. At the end of the day several kids started to put their iPad into backpacks- I had to explain that they were for class only- my, how their faces fell. Over the next weeks I took time to introduce the apps on the dock- those that I feel are as good as or better than traditional classroom materials and address learning goals more effectively or equally as well. Currently the dock holds two folders full of math and literacy apps, Sketchio, TeachMeK, Storykit, and Spaceboard K workbook. I also teach and reinforce the importance of being on task- not playing nondock apps during learning times- and if children don't follow the rules their iPad goes into a timeout and they have alternate supplies during times other kids are using theirs for the day. Sometimes I noticed children playing an app that utilized a skill I usually teach later in the year, such as telling time to the hour, or addition and subtraction. I introduce those topics with a mini lesson and give the whole group time to practice on their iPads. Some children arrive at school up to a half hour before the day officially begins. In past years I have given children who arrive early the choice to read or write, this year they can also read books on the iPad or use apps on the dock. Fridays are always a little different- the children pick math manipulatives to use, iPads are not available during Friday mornings. iPads are stored on table until needed. The children continue to use their dock apps, read books, or write while I take care of morning business, such as checking folders and ordering lunches. Next, I call the children to the carpet. 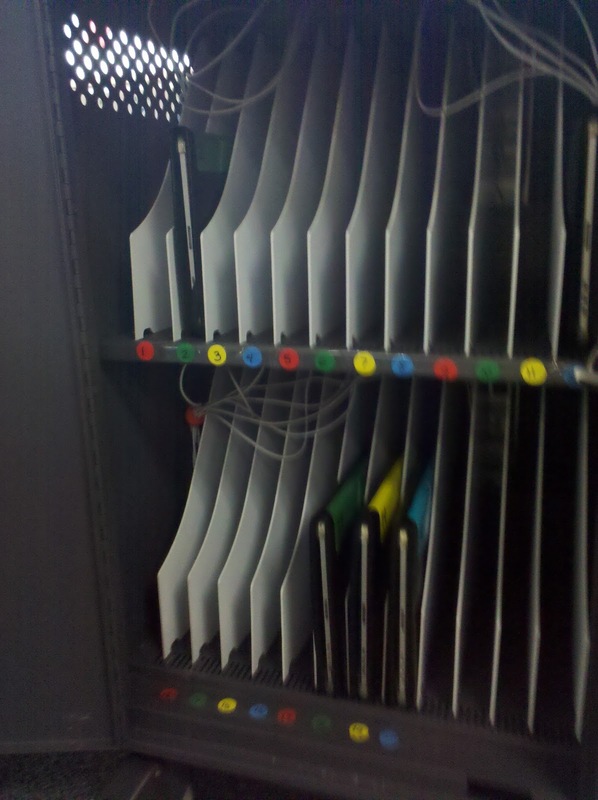 I have found it easiest for iPads to be left in the center of the tables; it reduces the time it takes to replace them in their slots on the cart and the inevitable line up angst (for readers who don't teach K, this involves several minutes of cutting, whining, pushing, shoving, iPads dropped, etc.). It also means that when there's a minute here or there that they are waiting on me or their classmates the iPads are in reach and they can work on learning goals instead of twiddling their thumbs, or getting into mischief as only a kindergartner can do. In the beginning I always reminded them to press the home button before closing their cover- this turns off any active app and eliminates any unwanted noise (except for the iPod music app, which runs in the background). The kids discovered the music on their own and it took a quick mini lesson to teach them to use the double click of the home button shortcut to locate and turn off (pause) the iPod music app. Occasionally I ask the students to bring the iPads to the carpet for a learning activity. I have them use Sketchio to write responses to questions, or practice writing letters, sounds, numbers, etc in lieu of using white boards or scratch paper (again, this saves a lot of instructional time and frustrations) - no passing out of supplies, dried out pens, broken pencils, and running out of space to write. In a previous post I described how I made conductive pens for student use; typically I have the students use those during writing practice. Maybe one day writing tools and paper will be obsolete, but until then students need to practice motor memory of correct letter formation holding a writing implement. Using my homemade stylus to write. During the morning I use the iPads off and on depending on what we are doing. 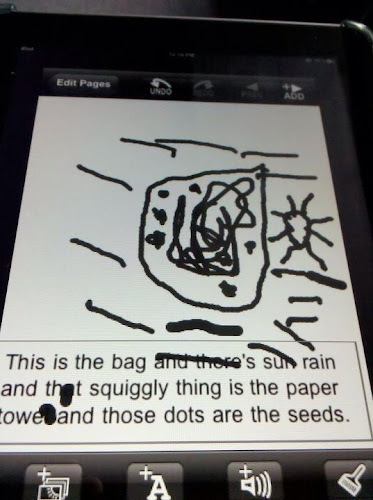 Sometimes the children use the Storykit app to draw and write, other times they use paper journals. During centers/Daily 5 (I am transitioning methods this year) children may use the iPads as an independent work station- either using dock apps or a few apps I have specified. During morning playtime kids can choose from any of the apps on the iPad, or anything in the classroom. Some kids are more likely to use their ipads than the others- just as there are some who play almost exclusively with legos or such. Now and then I leave the iPads in the cart all day or during playtime "to charge"- even if they don't need it-don't tell on me please! 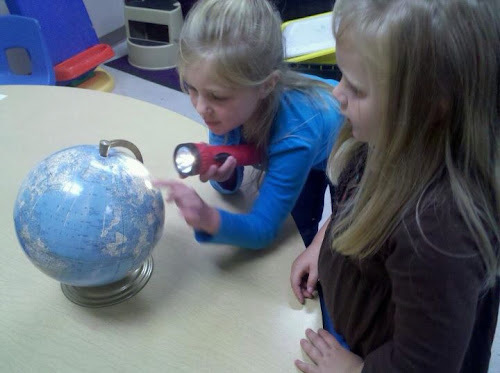 -to ensure all kids are engaging with others and real world objects. After lunch and recess, the children go to their reading group spots and do "abc" apps on the dock until the group is assembled. Sometimes they work on the iPad while I or the aides read with one or two children. The group that needs to learn alphabet letters/sounds goes through an alphabet app on the Pad- Preschool University has some good ones. My group uses Word Wizard a lot to do word work activities. After reading groups we practice math skills, sometimes using the iPad as an independent center using some of the awesome math apps available, as a whiteboard for writing numbers, or to practice a specific skill. This year I did not purchase any workbooks- all practice is done on the iPad or with classroom materials. In past years I purchased reading, math and handwriting books to practice skills with. The iPad is far superior to the workbooks- instant, self correcting, gives immediate feedback, kids progress at own levels and can be working at differentiated levels. A workbook page would have 3-6 questions per page and take about 5-15 minutes to get through. If they didn't understand only the kids I am close to would receive feedback and support, and a lot of time is wasted passing out booklets, writing names, waiting for others to finish, being on the wrong problem, waiting for the teacher to check work, tearing out the page and putting away... The iPad makes it simple, fun and so quick to practice the same skills, to say nothing of the opportunity for advanced or remedial instruction and instant feedback. I also love the element of choice it affords my students; they can choose from several apps that work on the same skills, thus increasing engagement. Just the other day we went on a 3D shape hunt with my iPad2 (how I wish all the kids had them instead of the original with no camera) and my aide had hers as well. We split into two groups and the children took pictures of cones, cylinders, spheres and cubes as well as 2D shapes all over the school. Then when we all got back to class the children took turns sharing the pictures they had taken and the name of the shape. Using iPad2 to find 3D shapes around school. 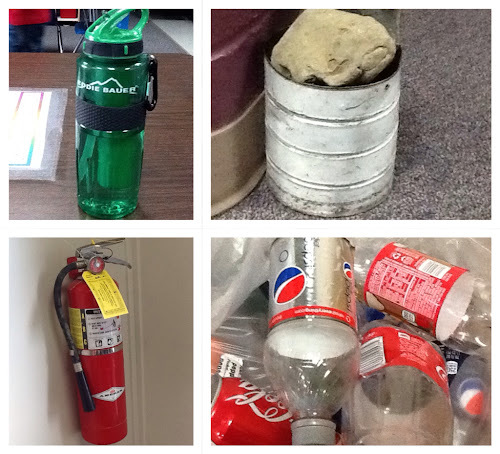 Using storykit to describe science activity. Other curriculum areas we use the iPad in are science (as a journal to record our observations) to check the weather, Social Studies- we tweet other kindergarten classrooms and find them on maps and the globe and learn about their lives; comparing similarities and discussing differences and even collaborating on play projects. Last week we played musical chairs using rules shared by kindergartners in Indonesia, they told us about studying Bahasa, and the kids are amazed by the fact that because they live on the other side of the world, they are at school while we are sleeping. The kids use the map app to see the area around our school, and find their houses and other places of interest. The possibilities for incorporating the iPad into the classroom are really endless... they make learning fun, relevant, challenging, supportive, and are ideal for this age group. Not only are the apps abundant for the early childhood crowd, the intuitive design and touch screen beg for little fingers. 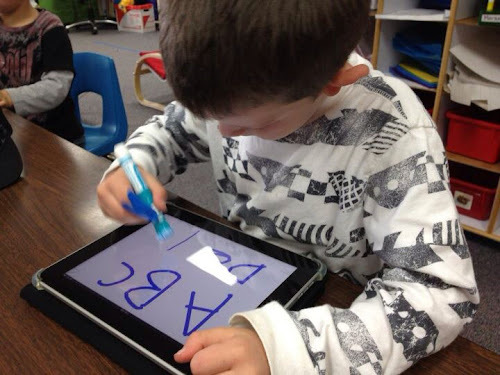 Do I think the iPads should replace paper, blocks, markers, and playdough? Of course not, but they do make a terrific replacement for worksheets that keep showing up in ECE classrooms. They can replace or supplement learning materials in place that are not as effective as they could be. Using Montessori 100 board in place of 100 board tiles and board, for example. I can have one app on the iPad that announces the numbers and doesn't allow incorrect placement of tiles; or dozens of the laminated boards and hundreds of the tiles that get lost, and allow children to mistakenly place 21 on 12's spot and children don't make the number/name association unless I am there to help, and I can't be there for 18+ kids at the same time. Similarly, for making words lessons, I would pass out 6-10 letter tiles to each child (which takes time to organize, pass out, orient letters correctly, they fall on the floor, etc.) Now I use Word Wizard instead, which saves lots of time, doesn't require storage, and will actually give children feedback on whether they spell words correctly. I do not think I can overstate how much I LOVE iPads in my classroom. I think they are powerful and engaging, and yes, fun. They are also a great way to help each child succeed, no matter their readiness for school in September. Call me appnoxious or addpicted... it's ok. I just DARE you to try using iPads with young children and tell me you think they don't belong in their hands. Awesome post! 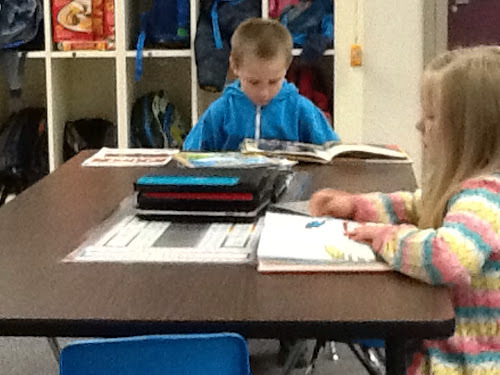 I loved hearing all the ways you found to incorporate the iPads into the school day! I also love that you know when to charge them (wink wink) and remind kids to interact with real world objects! Thanks so much for your post. I am now up to 5 ipads and hopefully will get the grant I wrote for another 5. Your ideas are very helpful. I also love storykit. It is amazing how fast the children catch on to creating stories. 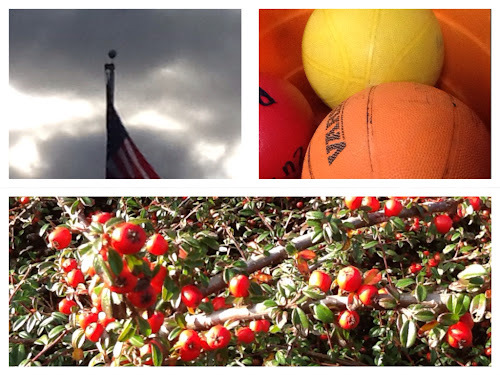 I have the ipad2's so my kids love taking pics to add to their stories. I have not started using the ipads for epals or twitter. Sounds like this could be my next goal. THANKS! Excellent description of your and your student's learning journey with ipads. Would you have information on some of the logistical, maintenance, and technical details that you could share? Would you have a concise list of all the apps you use and your view of the pros and cons for each? If you could share this info, it might be easier to email me. I have only one question: how much time do you estimate kids working with ipads? Thanks for sharing all of these great thoughts and examples! It's so helpful to hear about meaningful ways to use ipads with young children. I LOVE this!! We are SLOWLY moving to ipad use in the classroom, beginning with only 1 as a trial run. We will see but I am almost 100% convinced this is going to be the greatest thing in the classroom. I found the letter tile app in French! Thanks for the ideas. Do you use earphones with them? I have one...and it is noisy in our classroom! I teach Prep (first year of primary school)and we currently have 3 ipad 2s in my classroom. Can anyone suggest any suitable apps for this stage of the year. We love starfall alphabet (and many, many others) but would like some other ideas. A truly super post. The blance between iPad use and "real world" experiences is something I am sure exercises a lot of educators. Leaving the iPads on charge...genius! How do you manage cleaning the screens? Did your iPads come with a screen film? A protective cover? (It looks that way in the photo.) Do you number them or not? Assign kids to a numbered iPad or not? I LOVE your blog. I am moving to a new campus this fall and will all get ipads in our classroom. Your posts are so helpful. 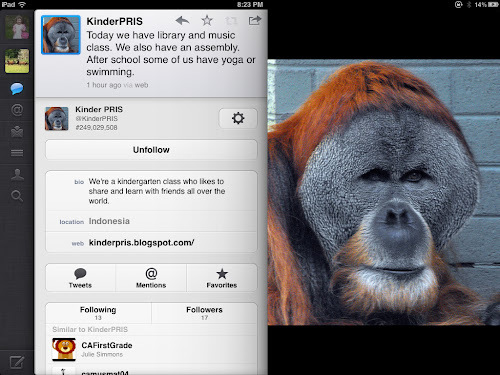 I was so excited to find your post about using iPads in your kindergarten classroom. I think using iPads would be an engaging way to promote literacy through technology. I would love to purchase at least five iPads for my classroom. 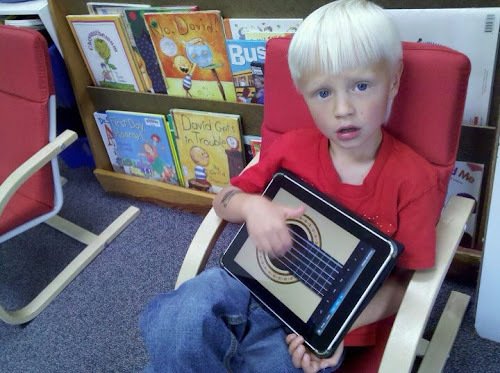 I would probably start by using the iPads during literacy centers. I would also like to use the iPads to help me create electronic portfolios with my students. The iPads could be used to take pictures and videos that could be uploaded to their electronic portfolios. However, I still need to find a way to purchase the iPads. I was thinking of creating a project at donorschoose.org. Another option would be to write a Beyond the Books grant. I was even thinking of purchasing one myself to get us started. Thank you so much for inspiring me by posting about using iPads in your classroom. I am doing some research on lesson plans using ipads in case using ipads in our district becomes a reality. I really liked your article. It was very informative. I hope your district does invest in an iPad cart (or more) for your school- they can be a powerful tool if used thoughtfully! I will be posting locations and dates of a seminar I will be presenting soon on using iPads and other technology in the Kindergarten classroom soon and by November I hope to have a comprehensive e-book available to help support teachers like you who are just entering into the world of iPads or those who are more familiar! How did you make your stylus? 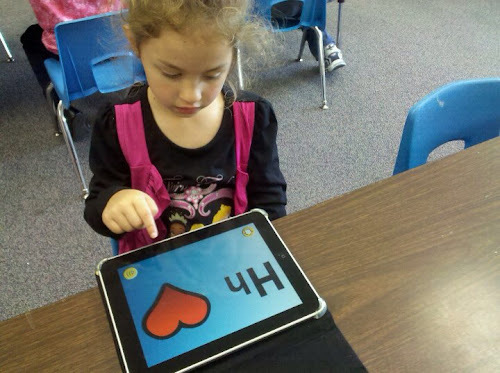 Would you mind sharing what apps you use for kindergarten literacy? I don't know too much about technology. I got an iPad for my small group of kdg strugglers and I don't know how to choose apps or download them or prepare them for students to use. I've been told that I need to get an iTunes accountand then someone told me that I don't need one. Help! Thanks!! Hello! My name is Kate and I am currently working on getting my degree in Early Childhood and Childhood Education. 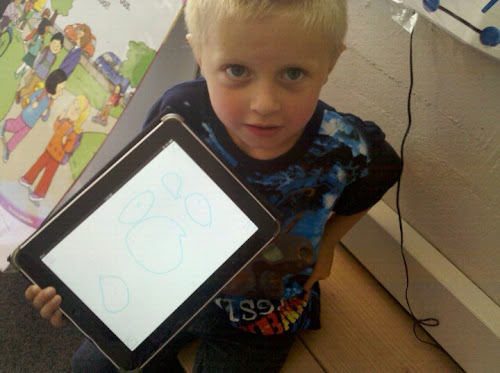 I did an iPad exploration project this semester where I brought an iPad into a Prekindergarten classroom. The items your brought up in this post really have me thinking about the power of the iPad more than I already believed the iPad had. There are so many great features that you pointed out. The differentiation is endless with an iPad. Do your students get the same iPad each day? If so, do you load different apps on each students iPad to cater to their needs or do all of the iPads have the same apps on it? I'm eager to hear back from you! One last question, do you change which apps are in the dock depending on the student? Hello! My name is Lindsey and I am currently a student at SUNY Geneseo majoring in Childhood/Special Education. This semester for my education class, we were given an iPad to extend lessons durring our field visits and I definitely have to agree that iPads can be used for educational purposes. I have learned that there are so many educational apps like ebooks, games, and learning tools that can be easily used by young children. I read your posts and I really enjoyed reading about how you used the iPads as a replacement for workbooks. I felt like it is such a good way to work not only on their math and literature skills but also their fine motor skills and promoting their understanding of technology. Plus, it's a great way to prevent wasting paper and the idea of multiple students being able to get help strait from the iPad instead of idly waiting for the teachers help is wonderful. I really enjoyed using the iPad with students from my practicum classroom and I really found myself enjoying it a lot! I believe that technology is really crucial in the classroom.